Budgeting for the cost of a bathroom remodel is imperative to a successfully finished product. If you budget for small improvements and then invest in expensive materials or major renovations, there’s a good chance you’ll go over budget and find yourself cutting corners mid-project to make up for the added expenses. It’s best to shop around for materials and ideas ahead of time. This allows you to save money for the materials you really want. It’s also smart to leave some cushion in your budget for any unforeseen complications. 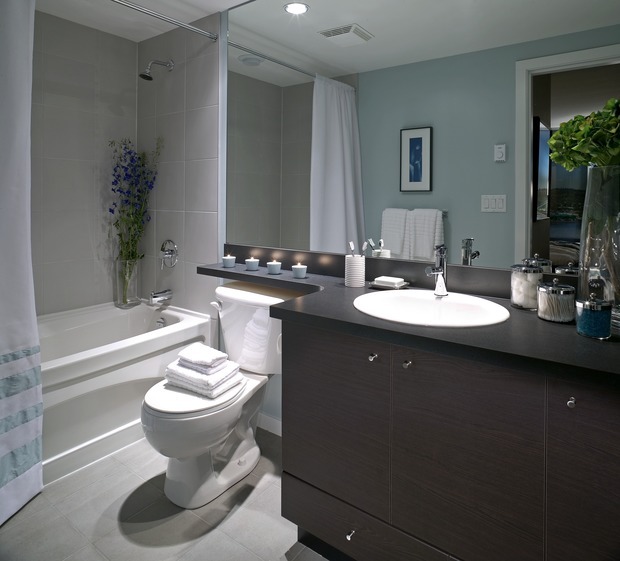 Bathroom renovations provide a great opportunity to go green. While some green renovations are a bit more expensive on the front end -- dual-flush toilets, double-pane windows and bamboo flooring, for example -- they can also save you money over the long term. Some smaller-scale, less expensive improvements can also provide long-term financial and environmental benefits. Consider LED lighting, low-flow showerheads and automatic shut-off faucets. Replacing the ceiling fan in your bathroom will help keep mold and mildew at bay. Airflow keeps moisture from building up humidity in small areas, which can rust metal and encourage mold growth on flooring and cabinets. You might need to hire an HVAC contractor to do the installation; they can recommend the best ceiling fan for your climate and bathroom size. Bathroom fixtures aren’t something you’ll want to skimp on. It’s best to buy quality, durable materials to avoid short-term repairs and replacements. This applies to flooring, lighting and appliances. Speaking with a bathroom designer will ensure that you get the best product for your budget -- especially when it comes to your bathtub and shower. Cheap plumbing components can break down easily, causing leaks and other issues. Strive to create enough space for the essentials without cluttering your bathroom with cabinets and shelves. You will probably need space for your linens -- towels, washrags, hand towels, etc., along with your toiletries and other essentials. You’ll also want to make space for cleaning products, so that it will be easy to keep your new bathroom looking its best. Shelving is ideal for toiletries and such; cabinets are optimal for everything else. This blog was contributed by Home Advisor. Great tips on upgrading to more energy efficient appliances. If you are remodeling then you might as well so that you can save more money in the long run. Thanks for posting! Fantastic tips for beautiful remodeling of bathroom. Great post for bathroom remodel…!!! your Bluetooth connection, so ensure to turn it on when you are ready to use the app. There are those that work on all handsets and those that work on only certain Nokia phones. It’s an unique and fun way to learn and improve your typing. Great tips indeed. But there one major element is skipped. What about shower system. For bathroom remodeling rain showerhead should be consider. I love all of the bathroom remodel tips you have. Don’t start your renovation unless you know exactly what you want to achieve. Know what you can do and what you can’t. If you’re at all unsure about your ability to complete a particular task, you’re much better off getting the experts in to avoid problems occurring later down the track. Bathroom remodelling is a pain especially if you don’t know how to do it. But, You have written some key point here and I like those point.